AS A LONG-TIME blogger, I've felt time pressures that often prevent me from writing long form items on my personal blog. But I record audio logs much more frequently and have discovered several interesting voices in the Audioboo community worth following. Christian Payne aka Documentally, the consummate storyteller. I'M WATCHING THE SUMMER slip away without any sort of hiking experience. So I'm living with the dream of bagging a few peaks as well as returning to England for memorable experiences. I listen to Audioboos shared by social hikers and that's one reason why I bought the boots in the video clip. And we stopped within 30 minutes of Stonehenge the last time we visited England. Going there is well overdue. The infamous Il Giardino on Google Maps. I READ FOODIE BLOGS and trust TripAdvisor when thinking about where to stay or eat. 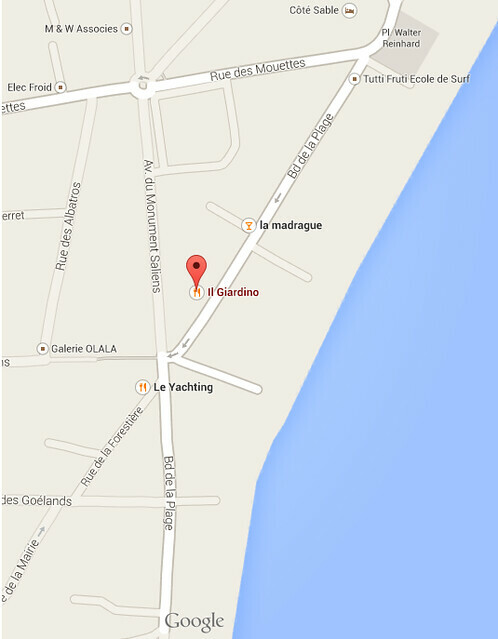 I've just added Il Giardino in Lege-Cap-Ferret (France) to my blacklist. French Foodie Caroline Doudet was fined thousands of euros for writing a bad review online. The restaurant was miffed and the judge agreed that because Caroline has 3000 regular readers, her review was prejudicial. Caroline stands by her critique but regrets not having left the restaurant from the beginning and therefore never having written the article. She does stand by the review. OUR OVER THE AIR mobile broadband speeds at home simply cannot penetrate the granite of the Rock of Cashel and use a 3G mast a few miles inside the town. Consequently, we are left fighting for service on a 3G mast standing six miles away and that mast appears to be stretched by subscribers using O2 and Tesco Mobile. I snapped a shot of 3G in Drogheda when we visited for my niece's birthday. Speeds there have always been three to six times faster than what I get in Cashel. I am sharing a Speedtest from my current handset. We need to get O2-Ireland running faster than my Hauwei Mifi allows and I think it means getting a USB data modem. When I run my O2 Hotshot in USB mode, it negotiates a faster stream. I hope the USB modem gives me the same result. Snap of curious cows by @topgold using Nokia E90. SINCE MY EARLIEST memories, I have listened to stories of cows. Recently, those stories come from Phil @daylightgambler Sorrell who never hesitates to identify a menacing bovine. As a young boy, my mother's advice to the curious minds of her five sons was "watch the cows" and she was certain we'd figure out how the human reproductive process worked. After all, she picked up all the relevant facts while growing up on an Iowa farm. I have to admit that I wasn't certain until I paged through several shelves of books she kept from her nursing school and emergency room days. EUROPEAN SUMMERS BRING the rumble and whoosh of airshows to every place I've lived except southwest Germany. And with those spectacular events come a flow of images I enjoy on the home screen of my Lumia phone. 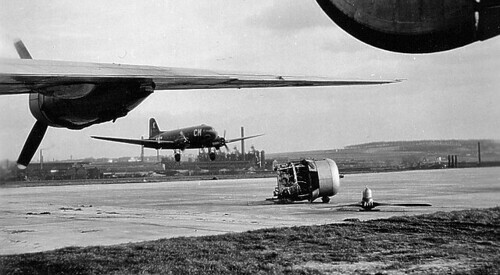 I think the big four engine bomber included in this blog post came complements of James Clay. My planespotting skills aren't good enough to identify the aircraft but I'm certain a few of my flying buddies are sharp enough to identify the make and vintage of this specific aluminum overcast. It doesn't have the vertical stabilisers of a Lancaster bomber but I can't make out the USAAF markings to determine if it's a Boeing B-17. Image of 76th Troop Carrier Squadron C-47 from USAAF. I HAVE SPENT hours thumbing through several history books this summer, rewinding my personal life into the annals of American military flying. Part of my own military logbooks intersects the familiar C-47 troop carriers. According to Wikipedia, the 76th went to Italy in July 1944 for the invasion of Southern France. They dropped paratroops over the assault area on 15 August 1944 and released gliders carrying troops and equipment such as jeeps, guns, and ammunition. The crews flew a resupply mission over France on 16 August 1944 and then transported supplies to bases in Italy before returning to England at the end of the month. That was 70 years ago. As a cadet in the Air Force Academy, I studied the debacle associated with the squadron's role in the September 1944 air attack on the Netherlands. The paratroops dropped there had a dismal result. By February 1945, the 76th moved to France and planned airborne assaults across the Rhine. Each aircraft (above) towed two gliders towards the east bank of the Rhine on 24 March 1945. This was tricky business. After the invasion commenced, the squadron flew resupply missions to Germany in support of ground forces. When I was with the 76th Military Airlift Squadron, it was approaching one million accident-free flying hours. I wonder whether the squadron reached that significant milestone. 1. Wikipedia -- "The 435th Operations Group"
PINBOARD TURNED FIVE and I'm glad to read maciej has stayed focus with a perspective that should ensure the service remains a part of the internet. Pinboard is certainly a niche service but one I depend upon for deep insight and resilient back-up of several Twitterstreams. It's fast, consistently informative and worth the small pocket money I contribute to its ecosystem. I jumped over to Pinboard at a time when Delicious looked wobbly. Several colleagues migrated to Diigo at the time--I'm happy where I landed because of the network knowledge effect gained as I sift through shared bookmarks. That kind of sifting became impossible after Delicious shifted its look and feel away from a text-first system. I AM TAKING cues from several successful creative multimedia students and starting to simply draw patterns that represent concepts. 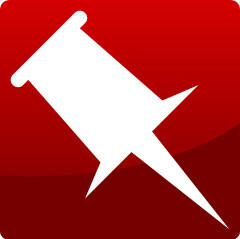 The image accompanying this blog post is a simple oval with arrows and it represents a core creative process. There is something about holding a pen (or a pressure-sensitive stylus) that facilitates learning. I have seen evidence of this through my 34 years of training adults. I can feel the process working for me this summer and I want to start a deep dive with the process by unpacking several lectures, producing drawings from core content and then possibly integrating the whole process into design thinking.